(CNN) - First lady Laura Bush said Sunday she plans to continue working to advance the position of women in Afghanistan after her husband's time in office ends in January. In an interview with NBC's "Meet the Press," Mrs. Bush also offered her take on the recent U.S. election, her first impressions of President-elect Barack Obama and incoming first lady Michelle Obama, and what she'll miss most. When President Bush spoke Tuesday at Fort Campbell, he said he will miss most "spending time with men and women who have volunteered to serve the United States of America." 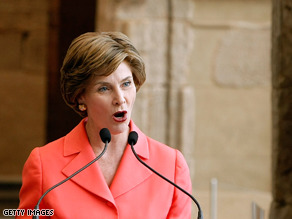 That speech "made me weep," Laura Bush told NBC. "I'll miss being with the military, too, and that's one of the things about Camp David that we liked so much, and that's going to church at Camp David with the people who are posted there... I'll miss a lot of things. I'll miss all the people that are around us all the time," she said. "From the ushers and the butlers who are there for every president and have been there four or five administrations, to our own staff, of course, that we love to laugh with and talk with and solve problems with. And so I'll miss the people the most." She said she and her husband plan to spend their weeks in Dallas and weekends at their ranch in Crawford, Texas. Also, President Bush "is going to build a freedom institute with his presidential library and museum at SMU (Southern Methodist University) in Dallas, and that'll be a really good vehicle, I think, for me to continue to work with, especially, women and children in Afghanistan," Mrs. Bush said. When she welcomed Michelle Obama for a visit at the White House recently, Laura Bush said, "the main point I wanted to say to her is that this is - the White House is a home, and it can be a very happy home for her and for her children and her husband, and it certainly has been for us." The first lady said she first met Barack and Michelle Obama at a gathering of freshmen senators. Asked Sunday whether she saw in them a prospective president and first lady, she responded, "Well, I don't know if I would say that, but I certainly saw somebody who was very ambitious and accomplished in both of them." Asked about the election, she called it "a major, historical event for the United States. And I think that's very good." Well you are writing a book. so tell the American people how your husband got into the Presidency? How he got the Presidency for the second term. Oh yeah tell how we are worst for wear. Now go back to Crawford to your Ranch, and spend your millions from oil! What a woman a valour...wow. Newsflash – this just in – the American people don't care a hoot about the Bushs' post-white house plans. Here's a thought – may we suggest an extended visit to Iraq? GO HOME, STEPFORD LIBRARIAN, GO HOME!!!!!!!!!! A former librarian married to a village idiot! Good Bye! Good Riddence! Hopefully we can all find out in your book why you've stayed married to that scumbag all these years. Of course it was probably just for the money.